The sister cities of Charleston and Savannah are often visited on the same trip and have increasingly come to resemble each other. Both have thriving restaurant scenes, booming economies and plenty of museums and attractions. Our writer visited both and came away recommending one new hotel in Charleston. Conveniently located near the Charleston City Market, this lovely hotel in a red-brick structure features an environment where Jazz Age glamour meets the Old South. The 41 guest accommodations and the stylish lobby and public spaces, including an outstanding bar with a clubby décor and a creative cocktail list, display a distinctive contemporary style and memorable detailing such as hand-painted wallpaper in the hallways. 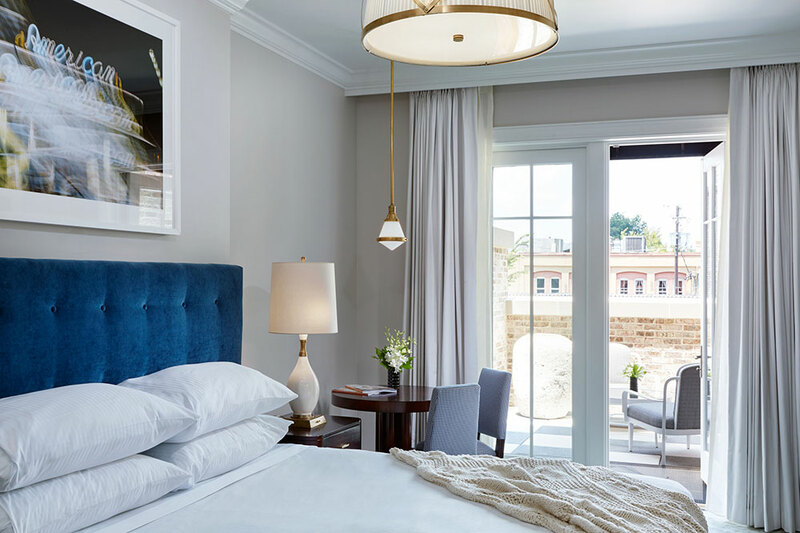 Suites have thick wall-to-wall carpeting, gentle lighting, spa-like white Carrara marble baths and charming framed drawings, photos and prints. Though the hotel lacks a pool, spa and fitness club. Read more about The Spectator Hotel.